David J. Gorack, 71, of Terryville, passed away Wednesday, Feb. 6, 2019, at home. David was born March 26, 1947, in Waterbury, son of the late Vincent and Elizabeth (Arabinick) Gorack. 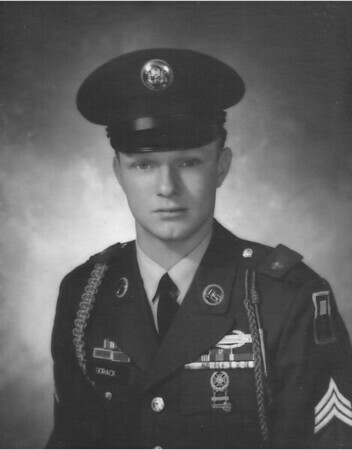 He was a U.S. Army sergeant serving a tour in Vietnam in the 101st Airborne Division. Prior to his retirement he was employed by the former New Departure Co. of Bristol. Dave was a member of the AA with 30 years of sobriety. He was a fan of the NY Giants, Yankee’s and UConn women’s basketball. Dave was previously married to the late Cindy Stewart for 15 years. He is survived by his sons, David Gorack of Bristol, Todd Gorack of Terryville, Ryan Gorack of Waterbury; his brother, Walter Gorack and his wife, Jeanette, of Terryville; his granddaughter, Sophia Gorack of Bristol and his nephews and niece, Jason Gorack, Walter Gorack Jr. and Kimberly Gorack. He was predeceased by his sister and brother-in-law, Elizabeth and Robert Bandish. Relatives and friends may visit at the Scott Funeral Home, 169 Main St., Terryville on Wednesday Feb. 13, from 5 to 7 p.m., with a military service to follow. Posted in The Bristol Press, on Friday, 8 February 2019 18:55. Updated: Friday, 8 February 2019 18:57.